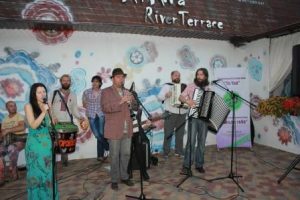 Since the autumn of 2018 Massorti Community, All-Ukrainian Charitable Fund “To You” (ACF 2U) in the partnership with Non-Governmental Organization “Social Capital” has launched Klezmer Radio project with Mikhal Stamov. The main goal of the project is popularization of modern klezmer music, its re-integration into Ukrainian culture, positioning Ukraine as a native land of klezmer music, Yiddish literature and Hasidism, to form an image of Ukraine in the world as modern European country and developing of cultural bonds of Ukraine with the world through Jewish heritage. –	Klezmer Today is the news and new music from Ukraine and all over the World. Also the guests (musicians, critics, historians, other specialists) are invited for each block. It depends on their free time or being in Kyiv. Radio Klezmer broadcasts twice a month on one the waves of one of the famous FM-radio stations. It is planned to broadcast on other radio stations should funds permit. We do believe that such radio broadcast is of a great importance for modern Europe and for European development of multicultural and multiethnic Ukraine in particular. In addition we are positively sure that klezmer music promotion will act in favor of anti-Semitism killing and will work for the sake of Jewish Ukrainian dialogue.